We attended a trail building session today. It’s been something we’ve been planning to do since last year, but between my knee op and my inability to get out of bed before 7.30am, never quite managed to achieve. Our main task was to do some maintenance on Follow the Dog, namely section 2. Section 2 has sadly been closed for a while due to forestry works, which has taken quite a toll on quite a few parts of the trail. Some parts had been quite heavily mashed, and today’s job was to fill in the parts that had been demolished by the logging vehicles and prepare it for resurfacing. It felt good to give something back to the trail, we got to meet new people, and it certainly gives you an insight to how much work the Chase Trails folk put in. It’s also slightly depressing how selfish some riders can be though – there was evidence that people had been riding the closed section, most obviously in the form of the destroyed fencing. I mean, seriously…it’s bright orange. It has a giant ‘No Entry’ sign on it. If a trail is closed, then it’s normally for a good reason, and riding it before it’s repaired/ready is just going to damage it further, and increase the time and effort required to bring it back to a fully sustainable, ridable state. So seriously, if anyone even thinks about riding over the partly repaired section that I lovingly raked before it’s ready…well, I will kill you in your sleep. Post trail building, we went to the café before going off for an afternoon ride. Mr Toast had a rather ill-advised banquet of a bacon baguette (following the bacon and mushroom sandwich he had for breakfast), a sausage roll and a cookie. He then went for a ride with Rob from Chase Trails, and rode trails far harder than he was expecting whilst feeling quite, quite ill. He enjoyed it, because it pushed him outside his comfort zone (that’s the ride, not the café pork frenzy – although I think he enjoyed it at the time…). I didn’t get lost this time, and ended up at the top of section 13. Did 13, 14 and 15, and headed back to Swinnertons. Top day all round! Remember, the more people that help out, the better maintained the current trails will be, and the faster the new ones will be constructed. Yes, I know that’s a bit rich coming from someone who’s only been to one trail building session so far, but I live 60 miles away. What’s your excuse?! And besides, they have prizes. Prizes! Bad bits: Er, none really. I need to get faster and fitter, but that’s about it. Oooh no, wait! Midges! MIDGES THAT GO STRAIGHT FOR YOUR EYES! Post ride food snaffled: Had a pre-ride cookie. Good dogs seen: The shar-pei and the St Bernard were out again. There was also a HUGE bear dog thing. I think it might have been a Pyrenean Mountain Dog. Again, it’s all a bit exotic. Lots of russells and spaniels too. On Saturday I decided to have a rare run around FtD with Mr Toast. He duly killed his speed (not the wife), and I certainly ramped up my speed to keep up with him. He noted that I was slower than when I had been on the Meta, but overall I didn’t do too badly. I think he found the waiting around in between sections a bit tedious though. Me: Yeah-no, wait, there’s someone coming. With Mr Toast’s encouragement I did the long section 8, and rode it at a reasonable speed. The jumps I could have done with tackling with a bit more speed, as I could have been a lot more stable, but otherwise I was pretty pleased with myself. It’s funny, I’ve been putting it off since I started biking again this year, mainly because I’ve mentally built it up into something that it’s not. Yes, it’s quite a fast bit of track, with jumps, but nothing I can’t handle, and I even came out of the climb the other end a lot better than I had last year. I’d say overall that my fitness (and knees) have improved, I just need to get my confidence back up to start tackling stuff at a decent speed again. Bad bits: Not being as fast as I was on the Meta. Curse cheating full-sussers! Good dogs seen: Bit of an exotic batch. There was what I think was a shar-pei and a St Bernard, plus a sweet puppy that seemed to have the head of a russel, the body of a corgi, and the soft folds of skin around the ankles of a bassett hound. Believe me, it was a good combination. What’s this? Yes, it’s the lesser spotted ‘post-work weekday ride report’. Hooray for British summer time! So, we got home, got our biking gear on, and got outside. The aim was to pootle through the country roads until we got to Burton Dassett, which is pretty much the hilliest area around Leamington, as far as I’m aware. The lambs were out in force, and we reflected how different they are to when they grow up. Lambs – highly entertaining, bouncing, frolicking lunatics. Sheep – they eat grass, shout ‘bear’ every so often…and that’s about it. It’s like they get to a certain age, and they get lobotomised, with all trace of personality erased. Which is shame, but probably for the best – it made me feel less guilty about the delicious lamb rogan josh I made after the ride. Nom. Got to the top, and took in the views. Sometimes it’s easy to forget what we have on our own doorstep. Admittedly, there’s not a lot of interesting trails around us, or even accessible bridleways, but as far as country roads, farmland and country parks go…well, it’s better than a poke in the eye with a sharp stick. Naturally, when we got to the top Mr Toast had to spend a good few minutes fiddling with his bike. Normally, excessive fiddling leads to complaining, then complaining leads to parcels from Chain Reaction and Merlin arriving at work. 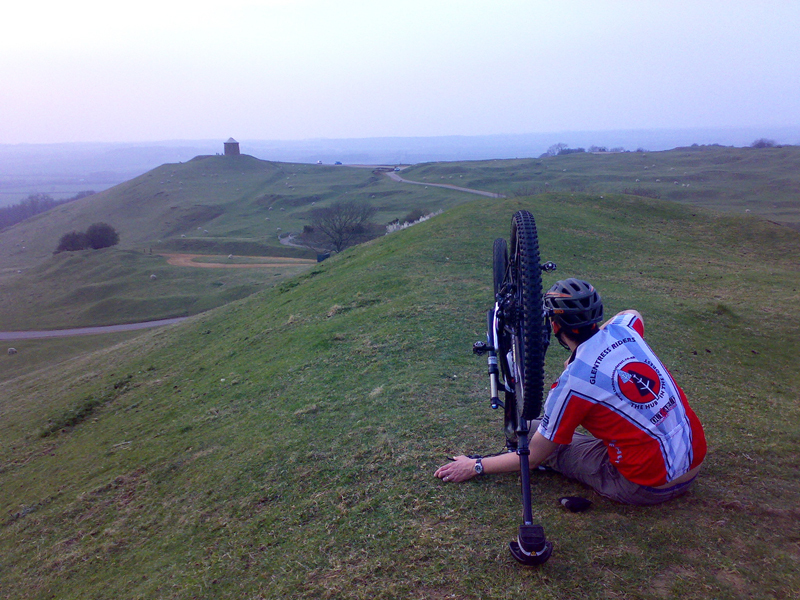 Ride: Bishop’s Itchington to Burton Dassett – and back. Trail: Mainly country roads, bridleways on Burton Dassett. Highlights: Laaaaaaambs! View from the top. Post ride food snaffled: Lamb rogan josh. Good dogs seen: Four jack russells, all different owners. Three were wire-haired, one was smooth. Jack Russells, the dog for this season.